It's really sad to see prominent Catholics ignore the Magisterium of the Catholic Church and support and/or encourage abortion. The Catechism of the Catholic Church is quite clear in its position on the issue, as well as its importance in Catholic teaching. Life begins at conception, and must be respected and cherished. Period. This clear-cut position, not shared by the United Methodist Church, Evangelical Lutheran Church, or Presbyterian Church, is spelled out in the Catechism from 2270 to 2275. 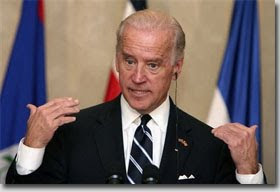 There is no wishy-washy, politically correct, gutless explanation for not taking a firm stand against killing the unborn in any Catholic teaching, which makes the existence of catholics like Vice President Joe Biden so puzzling. President Obama has seen fit to fill his cabinet with several pseudo-catholics, all of whom share his draconian views on killing unborn children. This dangerous precedent has brought the abortion issue to the forefront of the upcoming midterm election and is expected to sway voters, many of whom have come down on the pro-life side as of late. And this makes VP Joe Biden's latest grab for the headlines so puzzling: promising the African nation of Kenya that "money will flow" if their pro-abortion constitution passes. Is this really the image our country wishes to export to the rest of the world? Killing the innocent unborn? Sounds like more ammunition for Muslim extremists. Kathleen Gilbert has the story in LifeSiteNews. Click HERE for it. This video was removed from YouTube and then came back again via Breitbart and The Associated Press. The contents are kinda scary in a way, even though no blood was drawn. It's a video of Congressman Bob Etheridge (D-NC) getting rather truculent to say the least, with a couple of students, one of whom asked him about how he feels regarding the Obama agenda. Naturally the entitled Congressman felt it was okay to manhandle the student (I surmise) because he is a Democrat, and therefore not accountable for violent reactions due to his thin skin. In fact, I believe Websters defines Democrat as being emotional, quick to violence, and armed with no reason or accountability. You could see it in the anti-war rallies a few years ago, as well as the more recent pro-amnesty (for illegal aliens) rallies. Whereas Tea Party marches and Pro-Life marches are peaceful, well-ordered, and rather cleverly done, the liberal rallies are rife with violence, obscenities, and an intellectual void whose echos can be clearly heard through the mist of liberal apologetic media spin. While I will pray for the Congressman, I also hope the video is used at his trial. Get Ready For The Catholic Voters! CatholicVoteAction.org is calling the Catholic vote the true "swing vote." Whether or not you agree with this, you have to admit that 65 million Catholics in this country could sway an election if they could all agree on something. I think CatholicVoteAction is a worthy organization for your attention and even donations because their well crafted videos and other forms of activism can sway the fence-sitters among our faith. Their videos promoting adoption have been seen by millions online, as well as on TV in select markets across the country. With public opinion on abortion tilting in our favor (pro-life) over the past couple of years, in spite of the election of Obama and many pro-abortion Democrats to power in '08, one can argue that CatholicVoteAction may have caused the tipping point necessary to activate change. Enjoy the video, and please visit their website by clicking HERE. When I look at this man, Chris Christie, Governor of New Jersey, I'll admit it. I see a fat guy. But when I listen to him communicate, I hear....Reagan? No. This guy has more backbone than Reagan. Oh, wait. Am I allowed to say that? We lionize Reagan as we look back and view videos of his speaches, but seldom do we recall those times he succumbed to compromise sooner than we were comfortable with. But Christie seems like someone who not only articulates his point as masterfully as Reagan, but is also willing to go to the mattresses in order to get his way. And his way is fiscal responsiblity. Is it time for Christie to look beyond the Governor's mansion? Will it be in 2012? Is that too soon? Can we really afford to spare this guy? We should watch New Jersey closely and see how this all plays out.